After creating a recreational gymnastics business for an entrepreneurship assignment at the University of New Brunswick in 2006, Kara Hachey has since turned that assignment into a career. 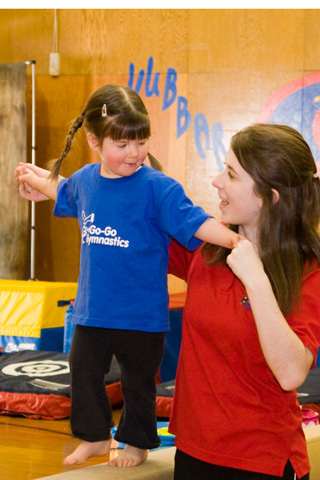 Go-Go Gymnastics is a mobile recreational gymnastics club that works out of 11 towns and cities, but it began modestly in Fredericton, N.B. with the hope of empowering and encouraging New Brunswickers to adopt healthy lifestyles. This, however, was only the beginning. With the success of Go-Go Gymnastics under her belt, in 2010 Hachey opened up Go-Go Gymrichment, an educational after school childcare program. Centered on science, leadership, entrepreneurship, arts and culture, and leadership, Go-Go Gymrichment focuses on developing children's personal leadership and self-starting skills. In less than two years, the company has grown to include nine licensed after school programs in Fredericton and Saint John – with expectations of teaching over 200 kids full time next year. Having participated in recreational gymnastics most of her life, Hachey says she wanted to focus on the fun aspects of gymnastics, rather than the competition. “I thought that our province, and country, had a gap with gymnastics programs focusing too heavily on competition rather than fun and fitness within the sport,” says Hachey. In completing of her plan, her business model, as well as plans for the building the programs would be held in, Hachey says her professors encouraged her to think outside the box. “They didn’t think setting up just another building would win any innovative prize,” she says. “We came up with the idea of ‘circus on wheels’ – a mobile gym – and from there completed the idea on paper. With her father in the Armed Forces, Hachey spent her elementary years travelling around the country. Finally settling in Fredericton, she attended George Street middle school and then Fredericton High School. Following her graduation, Hachey attended UNB for one year of Business Administration, then enrolled in Commerce at Carleton University for her second year, and finally finished her last two years at UNB in Business Administration. Although her original plan was to obtain a scholarship for a PhD in Marketing in France, she entered a student entrepreneurship business plan competition instead and won top prize. The only catch was, to obtain the prize, she had to start the business. “At 22 I decided to put my dreams of chasing my PhD on hold and run my idea of a circus on wheels so that I could receive the $20,000 prize,” says Hachey. “We opened doors in January of 2006 – eight kids at a summer camp – and had 300 by September that year. It all just came together. There was a clear need in our community for programming. Travelling around the province for work, and only being home two or three days a week, Hachey says it is hard to balance work and a personal life. Even with this time-consuming schedule, being in a different city every day - sometimes two or three in a day - Hachey says it is a very rewarding job. “Surviving six years in the NB market, seeing our employees grow, and when I see a child who normally wouldn't' feel comfortable participating in sports having a blast, it’s one of the best feelings,” she says. Her time spent at UNB, specifically in the Business program, gave Hachey the skills she needed to run a business and do it successfully. Contributed by Bronté James, Communications and Marketing. Story was made possible through UNB Associated Alumni.